Mike’s been having heating issues at work which have resulted in some pretty chilly hands. 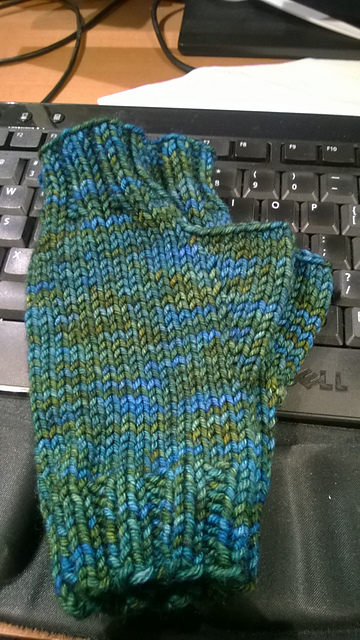 I had previously made him short fingerless mitts using this pattern (pictured below). But alas, when he needed to warm his hands up, they were nowhere to be found! So I grabbed a very small hank of worsted yarn we bought on Kauai on our first Hawaii trip (150 yards max, I of course already lost the tag) and started knitting. I went down a needle size for the ribbing. It makes it look a little weird when it’s not being worn, but snugger while worn.